A ledgestall is an advanced technique in Super Smash Bros. Melee that allows a character to refresh their ledge intangibility infinitely. There are three different ways to do this, not all of which work with every character. As soon as a character grabs the ledge, they will enter the CliffCatch animation that lasts 7 frames (3 for Link) and will have complete intangibility that lasts 30 frames longer than the CliffCatch animation. 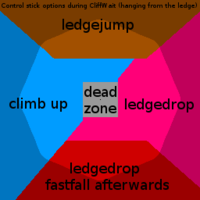 On the last frame of CliffCatch, they will be able to perform all ledge options except for letting go (ledge attack, ledge roll, ledge climb, or ledge jump). If they don't perform any of these, they will enter the CliffWait animation during which they can also let go of the ledge. To do this, they will need to move either the control stick or the C-stick from the neutral position to either a downward or a backward input. The character now has 29 frames of intangibility left that can be used freely. As soon as they drop from the ledge, the Disabled Regrab Period countdown timer starts at 29 frames (a character must wait ~half a second between letting go of an edge and grabbing it again). Thus, maintaining continuous intangibility requires dropping from the ledge on the first frame it is possible – otherwise, there would be at least one frame without intangibility on which the DRP timer was still active. Exceptions from this rule are Sheik's and Mewtwo's up special ledgestalls – their up special moves themselves have intangibility early on so they don't depend on the ledge intangibility as much. Zelda, Sheik, Fox, Falco, Mewtwo and Pikachu (possibly others as well?) can ledgestall with their up specials. Sheik's "Shino Stall", named after Japanese Sheik player Shino, is by far the easiest and most useful as her up special has innate intangibility, a strong hitbox and many movement options. This ledgestall is only possible with Captain Falcon, Ganondorf, Link, Roy and Bowser. By dropping from the ledge and immediately holding down to fastfall, these characters can abuse their high falling acceleration and low second jump height to reach the ledge and start falling again within 29 frames after having dropped from the ledge. It’s also possible to jump immediately after dropping from the ledge and fastfall after the peak of the jump. This is considered technically harder because holding down too long will prevent the ledgegrab. Rarely used competitively because of the high amount of precision necessary and the risk of losing the stock if even one input is slightly off. Referred to after Hax, due to his mastery and implementation of the technique. By letting go of the ledge, jumping towards it and wavelanding away from it, the ledgegrab box overlaps the ledge again just when the ledge intangibility has ended for most of the cast. Some characters, like Marth, need to fastfall in order to get down far enough in time before the intangibility has run out while others, like Captain Falcon need to waste a few frames so they don't fall below the stage before the intangibility ends. Marth performs the ledgedashstall with fastfall. Captain Falcon starts the ledgedashstall as quickly has possible. If he did fastfall, he would not grab the ledge. Captain Falcon uses his airdodge as late as possible while still staying invincible. If he did not fastfall, he would be vulnerable for a few frames. This page was last edited on December 19, 2018, at 14:05.